Hello there, I am back with another two teasers for the Clearly Besotted August release. Today I am using two new sets - Beautiful Friend and Aloha. Both stunning floral sets. My first card uses the Beautiful Friend set. This has two stunning floral images, along with some beautiful coordinating sentiments. 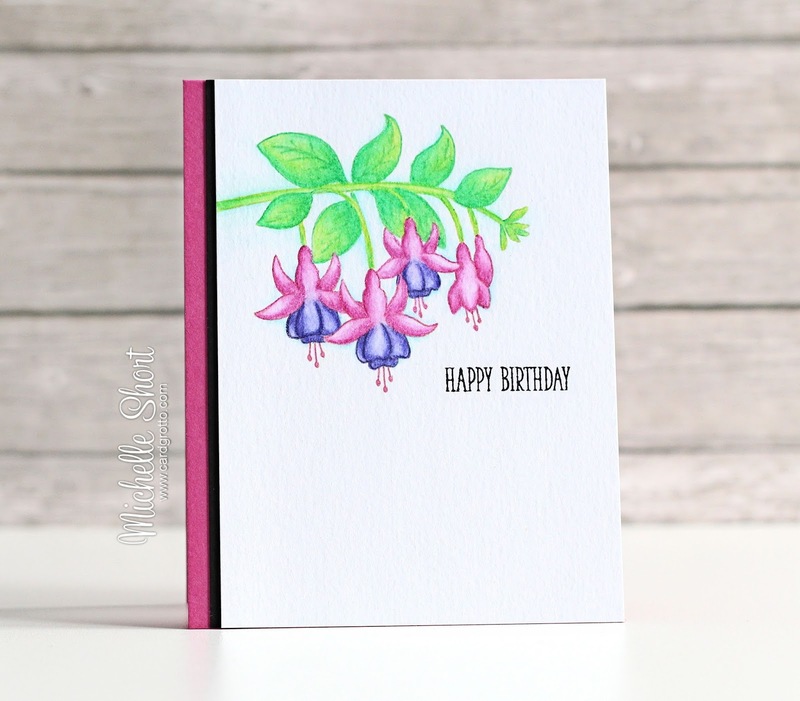 I started off by taking the Fuchsia image and stamping this on to a piece of TH Watercolour CS with Antique Linen Distress Ink. The image was then coloured using Derwent Inktense Pencils with water and a paintbrush. I wasn't necessarily going for a no-line look but I did not want a harsh black line either, this is why I used the Antique Linen ink. For the blue shadow around the image, I used a Zig Clean Color Real Brush pen, as I did not have a light blue in the Inktense pencils. Once dried, I stamped the sentiment, from the Many Mini Messages set, beside it. The panel was adhered to a SSS Doll Pink card base (A2 in size) along with a thin strip of black cardstock, to tie in the black sentiment. I went with a bit more of an 'artsy' look with this. I am used to doing smooth colouring, so it was a little out of my comfort zone! INKTENSE PENCILS: Fuchsia 0700, Violet 0800, Apple Green 1400, Field Green 1500. ZIG CLEAN COLOR REAL BRUSH PEN: 36 Light Blue. My next card uses the new Aloha stamp set, along with the coordinating dies. 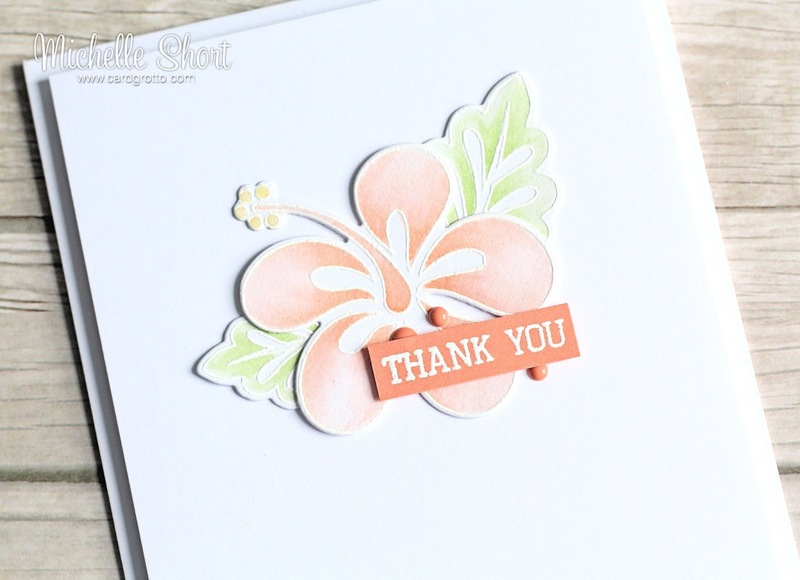 I started off by stamping the Hibiscus and leaves with Versmark Ink on to some white cardstock. I then applied white embossing powder and heat set. These were coloured using TH Distress Markers. I added very little water, since I was not using Watercolour paper. Once dried, I added a liberal layer of clear Wink of Stella to both the flower and leaves. The Hibiscus and leaves were adhered to a panel of white cardstock, which was in turn, adhered to a white A2 card base with foam sheet. I took a piece of PTI Melon Berry cardstock and stamped the sentiment, from the Beautiful Friend set, with more Versamark and also heat set this in white. The sentiment was adhered over the flower using thin foam tape. I finished off with a few Create A Smile enamel dots, as well as adding some Glossy Accents to the stamens on the Hibiscus. As always, please pop over and see Stephanie, who will have some amazing samples to share with you, along with links to all the other DT & GDT sharing today. I hope to see you tomorrow for more teasers from me. Thank you so much for visiting me today. Have a great day! Simply fabulous Michelle. You are one classy painter. You come up with such clever ideas Michelle, I am always inspired by your work and you are so talented. All of these cards are amazing, you have done fantastic job on these cards. You make CAS look easy Michelle when I know it takes great skill! These are just beautiful. Absolutely gorgeous cards! The coloring on both are amazing! Stunning cards. 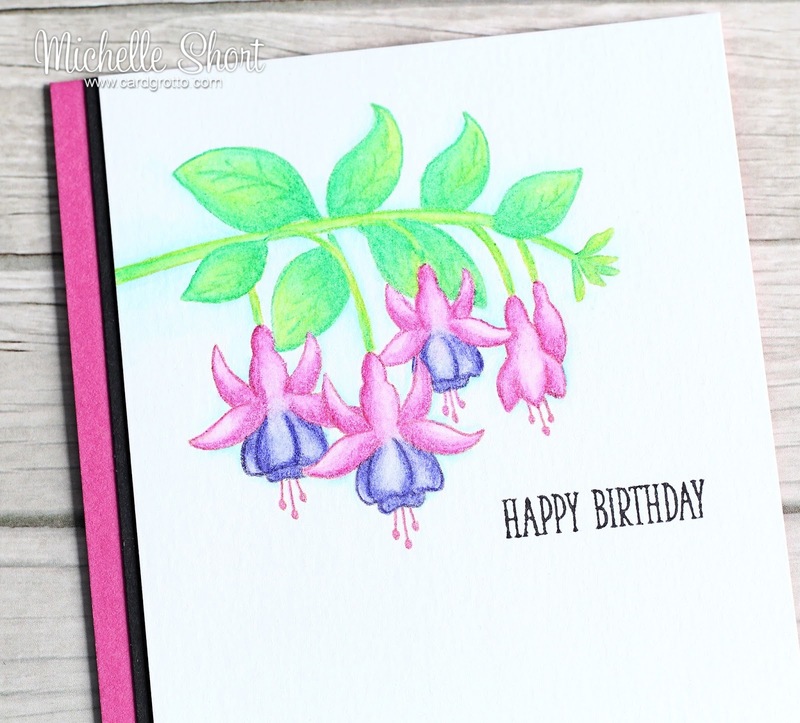 Your fuchsia's look amazing!